The Quantum Design MPMS 5XL SQUID Magnetometer with Evercool uses a superconducting quantum interference device (SQUID) detector to monitor very small changes in magnetic flux, and is extremely sensitive for all kinds of AC and DC magnetic measurements. Magnetic moments down to 10-8 emu (10-11 Am2 ) can be measured in a reproducible way. The MPMS has a temperature range between 1.9 K and 400 K, the superconducting magnet can reach magnetic fields between -5 T and 5 T. The advantge of the Evercool Dewar is that users are not required to cart liquid He in for measurements; the Evercool recondensor ensures that once the Dewar is filled with liq. He, any evaporative loss is recondensed, with the help of an attached gas line. This makes the device very useful, and user friendly. In our group, MPMS 5XL is manly used for measurements of static and dynamic magnetic properties of nanosized magnetic materials, such as 3d and rare earth metal oxides.This will provide the possibility to correlate nanomagnetism with the intrinsic structural properties of nanosized systems. The overall amount of collected data will enable the probing of the existing models and contribute to the deeper understanding of the nanomagnetism. They will also serve as the basis for the design of magnetic materials suitable for biomedical and technological applications. 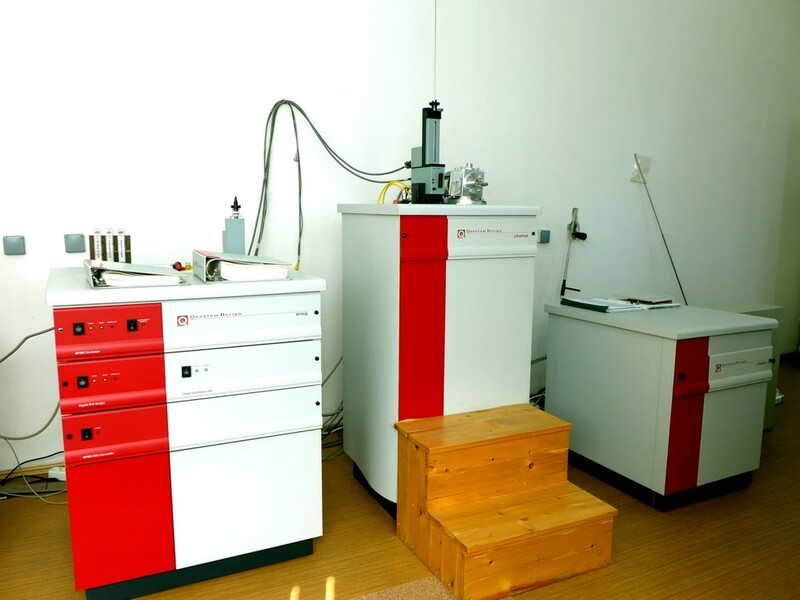 Applications of the SQUID magnetometer include the measurements for the characterization of all kinds of magnetic materials in physics, material science, chemistry, geology, electronics and biology. Multiple options of this device create a powrfool tool for studies of very wide range of materials, their properties and phenomena as antiferomagnetism, artificially layered structures, biophysics, fullerens, Hall Effect, heavy fermions, high and low temperature superconductivity, hysteresis, paramagnetic films, spin glass materials etc. Beside that, MPMS plays an important role in the effort to understand and optimize the synthesis process of materials such as amorphous alloys, inter-metallic compounds, magneto-optic materials, mesostructures, multi-layerd materials, rare earth compounds, superconductors, thin films, transition metal oxides and weakly magnetic materials.